I Guarantee these products will change your life dramatically! You can get a fast, no-hassle refund of your FULL investment by sending an email to [email protected]com (Don’t worry, my contact details are all in the members area) I’m so confident this information is going to change your life forever. Starting today... You can just say YES to changing your love-legacy forever! If you’re on the fence...don’t worry because all the risk is on my shoulders. Go ahead get the course and go through it at your own pace. Use all the exercises and techniques and if you don’t start experiencing heightened connection and intimacy, then simply contact me within 60-days and I’ll issue you a full and complete refund. No questions asked. If you simply try the Secrets of The Irresistible Lover course for 60 days and you’re not happy for any reason, then I insist on giving you a full refund. Our most successful women take us up on this offer. As a welcome to you, we invite you to join our Secrets Of The Irresistible Lover Gold community, where you will gain exclusive access to regular live and prerecorded content by Nadine Piat. Each session includes new and powerful insights and training and is available every 2 weeks, and is only accessible to members of the GOLD community. Your GOLD "Optional Membership" is completely free for the first month. After the free 30 DAY period has ended you will then be rebilled at only $24.98 for as long as you choose to remain a member. You may cancel at any time by simply emailing our support team. It is optional, and as a new member we invite you to try it completely free for an entire month, then rebilled at only $24.98 for as long as you choose to remain a member. You may cancel at any time by simply emailing our support team. Your purchase will appear on your bank statement under the name " CLKBANK*COM ". 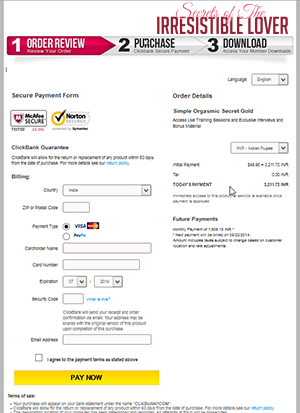 ClickBank will allow for the return or replacement of any defective product within 60 days from the date of purchase. * See more information below. Please untick if this free trail offer is not for you.